The Pacific S.A.L.T. 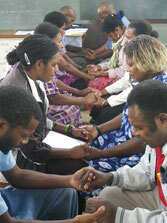 course is a two week intensive Scripture Use workshop conducted in the village at the request of local church leaders. S.A.L.T. seeks to encourage a love and wonder of the Scriptures among language communities and to equip local pastors and village leaders to effectively use the translated Scriptures. S.A.L.T. encourages the study of the Scriptures in their own heart language in order that language communities may develop an understanding of the Scriptures and develop a Christian worldview.